Mr. Teddy Kahil (2nd from left) receiving his award. Mr. Teddy Kahil has been appointed unit head of the newly-created Persons with Disability Assistance Unit (PDAU) under the Welfare Division, City Social Welfare and Development Unit, this city, effective February, this year. He is for the WMSU community, a source of pride. What makes this piece of news truly significant is the fact that Kahil is totally visually-impaired who finished his Master in Social Work Major in Clinical Practice in 2009 and passed the social worker licensure examination in the same year. He is never daunted by his disability. For a year or so, Kahil pushed for the passage of an ordinance that sought to establish the Persons with Disability Affairs Unit (PDAU) in the City Social and Welfare Development Office Zamboanga City. After a long and hard battle with the Sangguniang Panlungsod, the latter finally passed City Ordinance No. 354 which was signed into law by Honorable City Mayor Celso L. Lobregat on December 9, 2009. This is an important piece of legislation because, for the first time, an office for PWDs will be ran solely by PWDs. It is significant to note that the ordinance was passed and approved even before the signing, by then President Gloria Macapagal Arroyo, of RA 10,070 on April 6, 2010, which provides for the establishment of PDAUs in local government units. According to Kahil, he based his arguments during the Sangguniang Panlungsod deliberations on PADAU, on the strength of Article 13, Section 13 of the Philippine Constitution. The credit also goes to the city councilors for having opened their inner eye to see the value and wisdom of the legislation. The PDAU, Kahil said, is expected to suggest policies to the city government that would redound to the welfare of PWDs. It intends to respond to the practical needs of PWDs through programs and projects. The PDAU in Zamboanga City, Kahil revealed, is the first one to be fully operationalized in Mindanao, and one of the very few, nationwide. It seems that the dilemma of some LGUs which have approved the creation of a PDAU in their locality but have not operationalized this, is the fact that LGUs can hardly find PWDs who are qualified to run the office, Kahil opines. It must be stressed, he said, that a PWD also has to satisfy at least the minimum qualifications required by civil service law and rules, to be employed in government. Zamboanga’s PDAU is currently staffed by two other qualified PWDs, one of whom is also a registered Social Worker and a graduate of WMSU-CSWCD. That is why Kahil is profoundly grateful to WMSU headed by its President Dr. Grace J. Rebollos, and particularly the College of Education – Special Education Resource Center, for training and preparing differently-abled students for the world of work. He is thankful to the CSWCD faculty and staff for the support and encouragement which they give to PWDs like him. He also feels a deep sense of gratitude to Atty. Eduardo Sanson for believing in him and for encouraging him to finish his law studies which he has set aside, for the meantime. He is especially filled with gratitude to the Department of Social Welfare and Development in Region IX, through the Area Vocational and Rehabilitation Center (AVRC), which continues to support his endeavors and advocacies, and to many other kind-hearted individuals and groups, to whom his gratitude is boundless. 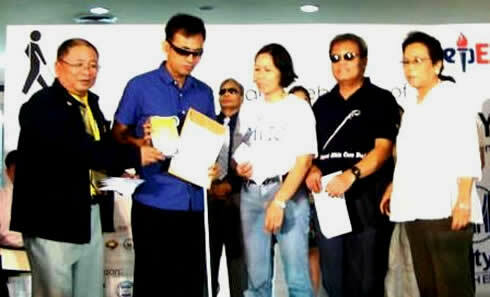 Kahil was given the Outstanding Visually Impaired Award (OVIA) by the White Cane Inter-Agency Committee on August 1, 2010 in Quezon City for his “exemplary performance and active involvement as a representative of the disability group, making a difference in the lives of his fellow blind in Zamboanga through his active leadership skills in managing an organization that provides gainful employment to the visually-impaired masseurs . . .” Kahil is the founding president of VISTA (Vision), a non-government organization that operates a massage therapy center in Zamboanga City run by blind masseurs.